A significant set of observations has taken place. On Mother’s Day and the day following of 2007, another major aerosol operation was conducted over the skies of the Santa Fe, New Mexico region. A more detailed visual examination of some of these emissions has been made; mechanical, artificial and systematic introduction of the aerosols appears evident. There are two primary observed anomalies at this time: the first of these is the presence of what may be referred to as “core tracks” (ribbon-like; possibly filamentous in nature) and the second is the repeated presence of a characteristic “pulse” emission. 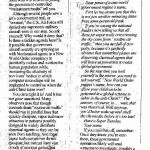 The behavior and character of these anomalies is now being presented and an adequate basis for further examination exists with this article. These characteristics are completely out of accordance with any claims of meterological discontinuities in the atmosphere, any uniform fluid or gas dynamic analysis, and any unmodified combustive process. It is apparent that distributions of discrete material into the atmosphere are taking place. Complete Identification of these processes and the unusual chemical and physical reactions that accompany them are required to safeguard the welfare and interests of the citizens of this planet. A set of control photographs exist at the end of this report. Exposed shortly after passage of aircraft. Core tracks appear in this case on one wing side of the aircraft only. Core lines appear in this case on one wing side of the aircraft only. for subsequent pulse pendule development. Exposure taken a few seconds after the preceding photograph. this indicates a discrete substance from that of the trail. A relationship to previously disclosed filaments should be considered. 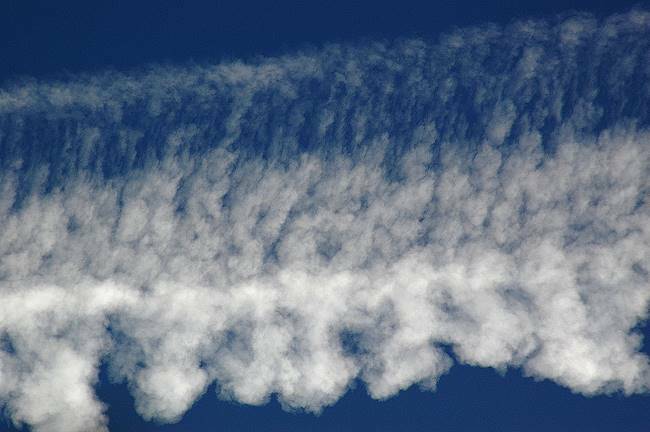 It has been a question for some time as to why the “pendules” form as a regular component of the aerosol trails. It has been claimed by some that such pendules are just a normal development from customary meterological conditions. 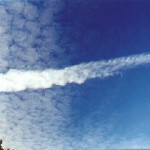 They have been referred to by certain parties as virga, which are defined as ” wisps of precipitation streaming from a cloud but evaporating before reaching the ground1.” Two objections can be immediately raised: first we are not dealing with “clouds” by definition (as clouds and conventional aircraft emissions are entirely different physical processes), and second, such a phenomenon would obey uniform laws of motion and not be commonly recorded in a repetitious or pulse formation. It is also clear that the aerosol materials are not immediately descending(as precipitation is expected to), but that they are expanding and are part of an extended physical-chemical reaction outside any bounds of evaporation. In addition, such pendules will not be observed in combination with normal contrail formation, as evaporation, dissipation and rapid mixing of the heated water vapor into the air will dominate that process. 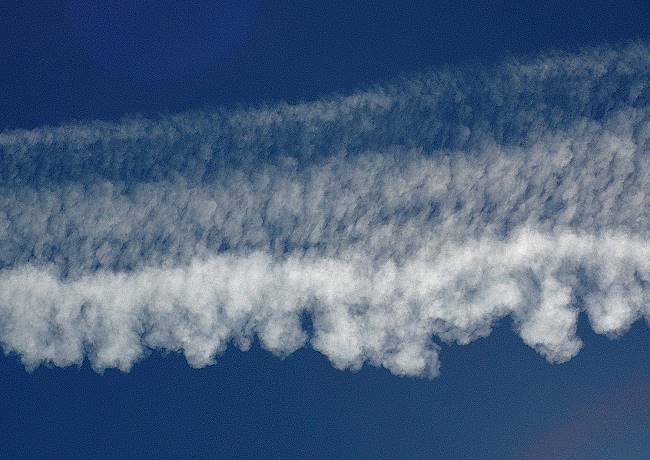 It has also been clear for some time that an asymmetric process is involved in many of the aerosol formations, however, any clarification of that process has eluded most observers. 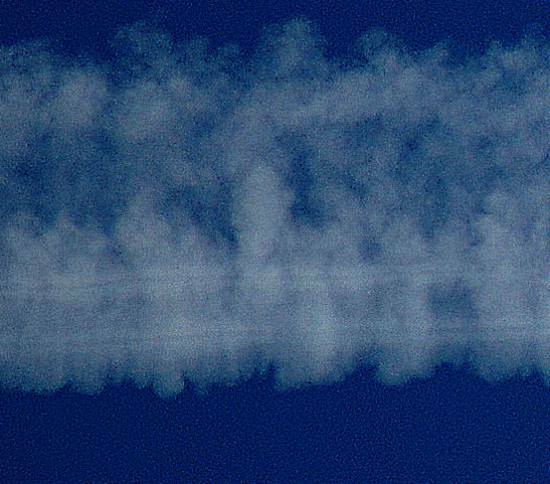 What follows is a progression of photographs that will demonstrate the further developments, transformations and reactions within an aerosol trail under examination. This progression occurs over approximately a 20 to 30 minute period. The time of this series is approximately 1015-1045. The initial sky conditions were generally clear and sunny, although it was apparent that an extensive aerosol operation had been previously conducted to the south. The result of the operation is that the sky became progressively occluded during the two day interval of this report. The majority of the occlusion was accomplished within the first few hours of the operation. Exposed immediately after passage of aircraft. Core tracks remain slighty visible, but are dissipating fairly quickly in time. Estimated time into progression series approx. 30 sec. Transformation into striated form is beginning. Core tracks essentially no longer visible at this stage. Stronger striation and beginning of pendule development on the side where core tracks were visible. Greater separation of materials towards a pendule form. Strong separation into pulsed pendule form on the side where core tracks previously existed. Stronger separation into pulsed pendule form on the side where core tracks previously existed. Approaching full transformation within the boundaries of the expanding trail. with previous core track locations. Final development within the boundaries of the expanding trail. The core lines reported in this article have been observed at earlier times; they have been recorded during one scene of the documentary available through this site. The advantage of the current report is that clear images of the progression have been recorded. The process indicates a systematic distribution system that produces unusual and remarkable physical transformations in a relatively short period of time. The reaction is one of increasing, rather than decreasing intensity. It appears likely that ionization and dessicant qualities are significant catalysts in the reaction. The role of the core lines is not determined at this time, however, it appears quite possible that they are involved in the subsequent pulse and pendule formations. High quality imaging equipment is required to document the core tracks and they may be visible only under favorable lighting conditions. The possible relationship between the core tracks (ribbon-like in form and behavior) and the filamentous materials discussed extensively on this site must be considered. Any attempt to conceal the presence of the ribbon formations, past, present or future, should also be considered as a possibility. It is recommended that these observations be explored in greather depth so that the mechanics and materials of distribution and the physics of transformation can be more fully understood. Entire Progression Time is approximately 15 seconds. Approximately 5 seconds after passage of aircraft. Approximately 10 seconds after passage of aircraft. Approximately 15 seconds after passage of aircraft. 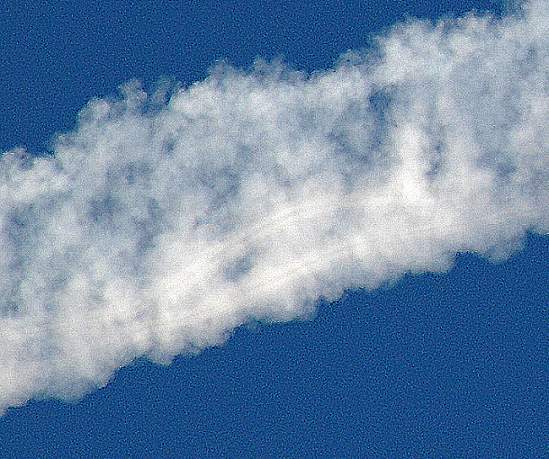 After approximately 20 seconds after passage of aircraft, all visible traces of the contrail are gone. Photographs include post-processing with gamma and sharpening filters to improve detail.